Harry R. Anderson, "Fixed Broadband Wireless System Design"
Fixed broadband networks can provide far higher data rates and capacity than the currently envisioned 3G and 4G mobile cellular systems. Achieving higher data rates is due to the unique technical properties of fixed systems, in particular, the use of high gain and adaptive antennas, wide frequency bands, dynamic data rate and channel resource allocation, and advanced multiple access techniques. At present, there are no titles available that provide such a concise presentation of the wide variety of systems, frequency bands, multiple access techniques, and other factors that distinguish fixed wireless systems from mobile wireless systems. 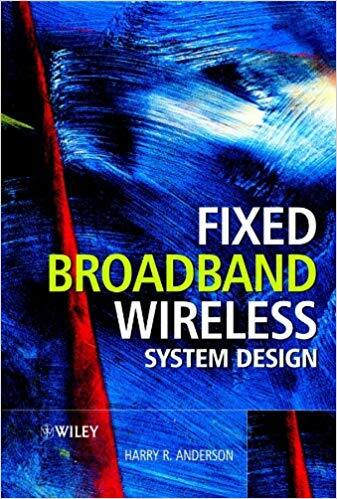 Fixed Broadband Wireless System Design is essential reading for design, system and RF engineers involved in the design and deployment of fixed broadband wireless systems, fixed wireless equipment vendors, and academics and postgraduate students in the field.